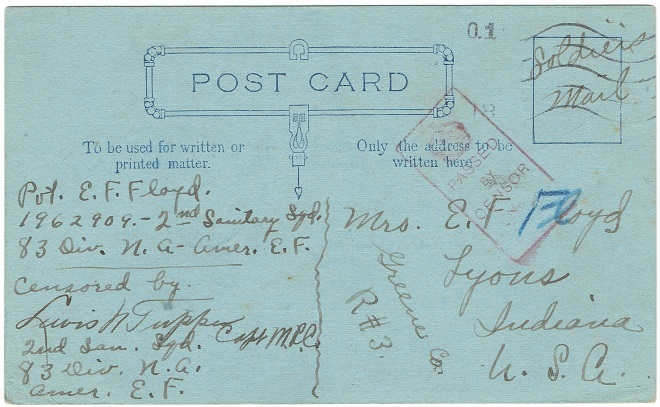 2nd Sanitary Squad "World War One Post Card"
This is an original censored WWI AEF Post Card dated July 1, 1918 and franked with stamp "Soldiers Mail". 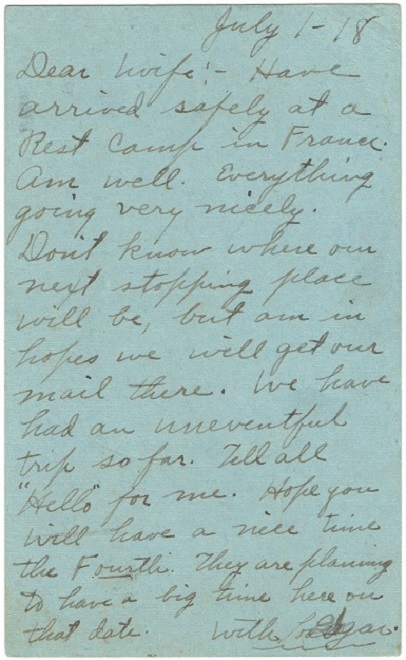 The Card was sent by Pvt. E. F. Floyd to his wife Mrs. E. F. Floyd, R.F.D.#3, Lyons, Green County, Indiana. The address it was sent from was somewhere in France on this date. 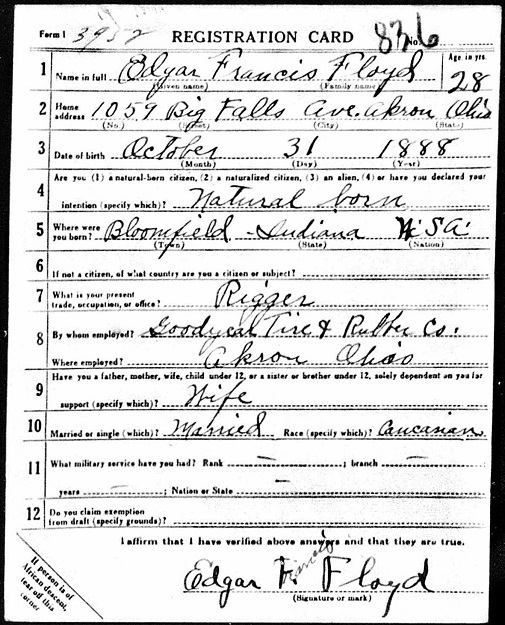 EDGAR FRANCIS FLOYD was born on October 31, 1888, in Bloomfield, Indiana to William M. (1862-1914) and Margaret C. (Hardisty) (1867-1901) Floyd. 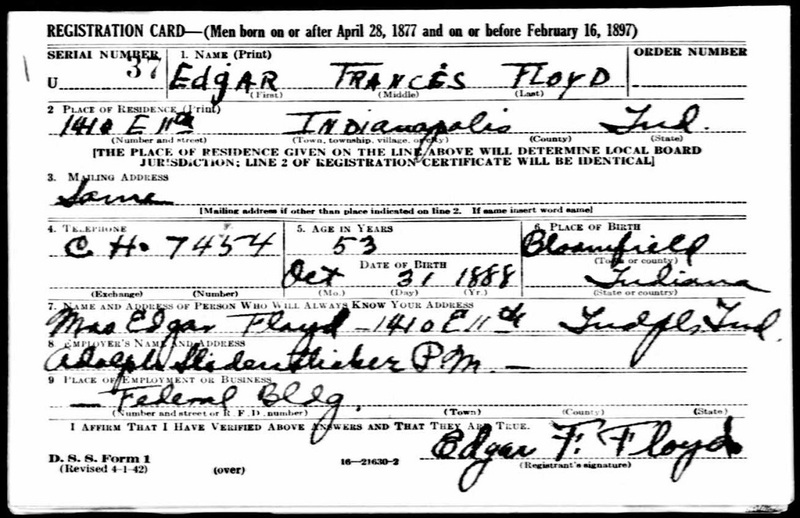 Edgar Floyd (#1962909) 29 years old at that time, enlisted in the Army on December 17, 1917 in Akron, Ohio. Before going overseas, he married Nellie A. Hawkins. On the base of the address R.F.D.#3 (Rural Free Delivery was a service to deliver mail directly to rural farm families) we can understand that they where a farmers family on the countryside at that time. After joining the military he was attached to the Medical Department, 315th Sanitary Squad until January 16, 1918. 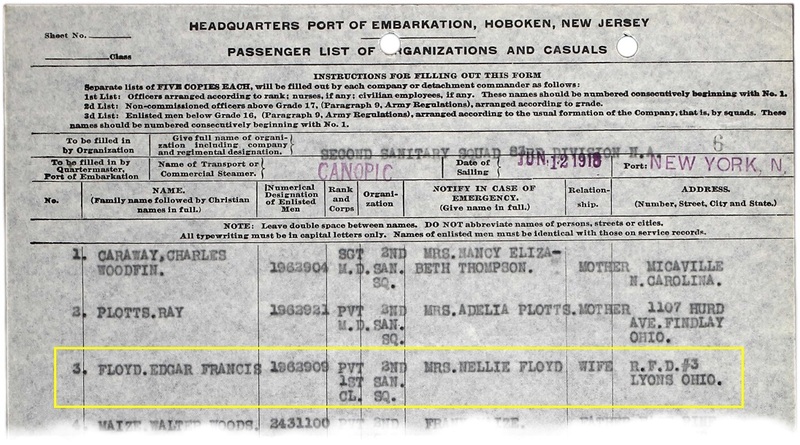 One week later, Edgar Floyd went overseas as part of the Medical Department and was with the 34th Sanitary Squad until discharged. On April 16, 1918 he was promoted to Private First Class. In France, General Pershing attached 2 sanitary squads to each division-each consisting of 1 officer, 4 noncommissioned officers, 20 privates, and 2 drivers-plus 1 mobile laboratory consisting of 1 officer and 5 enlisted personnel. Edgar Floyd's unit was the 2nd Squad attached to the 83rd Division. He arrived back in the US on March 24, 1919 and was honorably discharged two days later, on March 26, 1919. 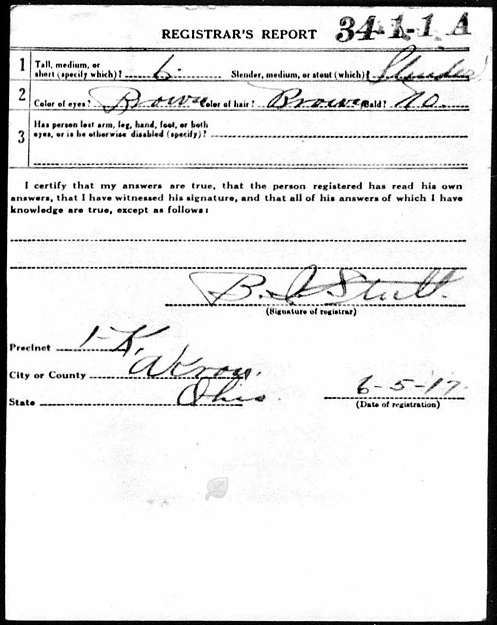 United States World War II Draft Registration Card 1942, referred to as the "old man's registration", conducted on 27 April 1942, for men born on or between 28 April, 1877 and 16 February, 1897 (age 45-64).